Notice how the first skateboarder is going down a steeper ramp. In math, steeper means bigger so the slope of that line is bigger than the slope of the second skater's line. You may also notice that the skaters are going down the ramp from the left to the right. This makes the slope decreasing, or negative. 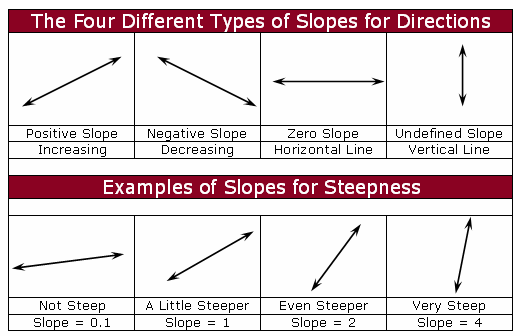 Remember, the two things that we have to keep in mind when understanding slope. Slope measures the direction of the line - whether our skater is going up the ramp (positive) or going down the ramp (negative). It also measures the steepness of a line - the steeper the ramp the larger the value will be for the slope! Of course, there are some other slope scenarios that could occur. We will use our trusty skater to demonstrate those as well. For instance, a skater could also skate on flat ground, which would mean that there is no steepness to the line and therefore it would defined as zero slope. Or, if our skater was a true daredevil and wanted to go straight down the side of a building or ramp, that would be known as an undefined slope. Now that you understand slope, you can go onto the next lesson: calculating slope. As you know, understanding slope and the y-intercept of a line are two very important topics in algebra. Make sure you got them! Return to other free algebra help topics. Return to the GradeA homepage.